1) Tonight, the last Art, Technology, and Culture Colloquium lecture of the year, given by choreographer Jonah Bokaer. 3) Also on Thursday, the last talk in the History and Theory of New Media lecture series, given by Rita Raley. 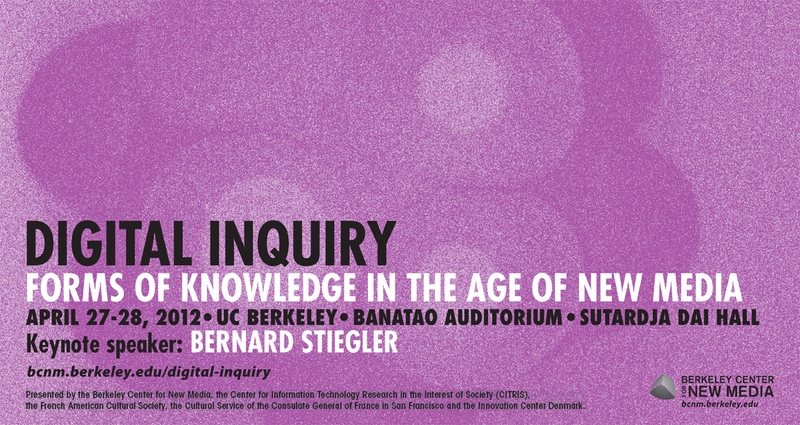 4) On Friday and Saturday, the Digital Inquiry symposium featuring keynote speaker Bernard Stiegler. I’m personally planning on attending 3 out of 4 of these great events (okay, I have to go, since I’m working tech and moderating a panel, but still)! The debate about the latest round of anti-piracy legislation (SOPA, PIPA) revealed sharp differences in how people conceptualized the Internet, creative work, and the relationship between the two. Much of the debate was framed as old vs. new: an older generation of people, technologies, media institutions, and notions of creativity clashing with the Internet, youth, and a revolution that they have brought about. Indeed, the web and social media help constitute new infrastructures for the distribution of media products and the social recognition of people—younger and older—as creators and artists. Conventional features of the contemporary web provide new means for the display of artistic products, tools for social commentary and interaction around these products, and means of enhancing existing artistic communities or forming new ones. Over the past decade a Web 2.0 “creativity consensus” has emerged that envisions creative and artistic production via new Internet platforms as universal, democratic, communal, non-commercial, and revolutionary. The avant-garde of Web 2.0 creativity are said to be young, web-savvy media makers: a digital generation that has embraced new technology and is upending old notions of creativity and related cultural practices. In this talk, however, I argue that a critical aspect of what is new about the web is in how it resurfaces old tensions in art and creativity and brings them into contact with ideals of the Internet. The consequences are the generation of new tensions in practice that in turn propels the ongoing production of the web. I draw from a four year ethnographic investigation of deviantART, a web site that describes itself as “the world’s largest online art community” with the tagline “where art meets application.” In this talk I will examine the consequences of deviantART’s introduction of a seemingly conventional set of features for sharing content on the web. These new share tools sparked a six week conflict among site members and designers that conflated technical and moral arguments about how art and the web work. The conflict surfaced new tensions among ideas about property, theft, sharing, and marketing and, in turn, the nature of the web. Rather than seeing young, web-savvy artists as the avant-garde of new forms of creativity tied to the inherent nature of web technologies, I argue that participants in deviantART play active roles in seeking new balances between historical tensions in art and the web. These young creators are thus important participants in producing deviantART and the web more generally. Dan Perkel completed his PhD at UC Berkeley in Information Management and Systems with a Designated Emphasis in New Media. His research examines the ongoing development of new forms of distribution infrastructure for creative practice. Titled “Making Art, Creating Infrastructure: deviantART and the Production of the Web,” Dan’s dissertation featured an ethnographic investigation of the mutual production of new web technologies and young creators’ identities as artists. Dan has also been active contributor to the MacArthur Foundation’s Digital Media and Learning initiative, first as a researcher on the Digital Youth project and then as researcher for the initiative’s hub at UC Irvine. He holds a Masters in Information Management and Systems from UC Berkeley’s School of Information and a Bachelor of Arts in Science, Technology, and Society from Stanford University. Learn more about his recent work and publications at http://www.danperkel.com. being truly worth commenting down here in the comment section!